Scene—an historical well outside of town, midday, hot. A lone woman approaches—apprehensive but bold, and begins to draw water. She only goes at noon when she won’t be harassed or shunned by the townswomen…the ones who look down on her because of her lifestyle, her flaunting of social and religious norms. It’s as if she is an untouchable. She thinks: What is this strange man doing at my well—at my time in the heat of the day?? It’s all in her demeanor—her defense shields are up, she is ready for a confrontation. After all, she has been around, knows how to handle herself, she can hold her own with the best of them and their usual reaction is to back off—to let her alone. She sizes him up, this Samaritan woman—he doesn’t look threatening---sort of skinny…been on the road a lot…dusty and tired. She moves closer and falls silent in his penetrating gaze…it frightens her, but she doesn’t know why. “What do YOU want?” she asks….challenging…territorial…”why are you staring at me?” thus begins the banter that leads to a promise of living water and the ever-flowing font of eternal life. She evangelizes the village. Perhaps she was just then, hopeful enough to give Jesus her last chance at a different vision for her life. A Samaritan woman of our time would be street smart, tough, defensive, guarded…but also wounded, hypersensitive, hungry for real love, thirsty for a drop of compassion, vulnerable. I used to be a chaplain to female inmates of the Fresno County Jail. I would see them weekly for formal religious services and informally upon request. Often, I would be there long before clergy had the time to come and would meet with them one-on-one in the spaces usually reserved for attorney visits. These contact visits early in incarceration were often emotional for the women—especially the “first timers.” In the large common room they could maintain their bravado; in the privacy of the attorney rooms, they could let down their guard. Like the Samaritan woman, they didn’t talk about what they had done. Usually conversations centered around fear for their children, their job and would I please pray for them. Jail chaplaincy is different from prison chaplaincy…jail is usually short term until a case is heard or bail is posted. The population is very transient—different inmates each week, no time for programming or to establish relationship or trust—a revolving door. If an inmate is there long, the case is usually a serious felony—in a few cases, my inmates were there for capital offenses. California still has the death penalty. Many were like the Samaritan woman—desperately seeking some means of hope, some promise that would actually be fulfilled—in more ways than one-for life. These women craved a sense of self-worth—craved positive attention. I suppose what we had to give them was like what the Samaritan woman found in Jesus—presence, real listening, the assurance that yes, God did love them…no matter what. So many were fearful that they had gone beyond the boundary of redemption…they had tested that boundary so many times. But don’t we all give living water every time we dispense hope, acceptance and compassion? And aren’t we revived by the words of the gospels when it seems like Jesus is speaking right to us. When we ponder the humanity and divinity of Jesus, we sometimes think about times that Jesus, even Jesus, learned something—especially from a woman. Although the stories appear in different gospels, I think of the recorded encounters that Jesus had with the women of the New Testament. At Cana, Mary ignored Jesus’ protest that his time was not yet and asked the servants to do whatever he asked—anyway. Or the Syrophoenician woman with the sick daughter. Our western sensibilities are offended when Jesus refers to the woman as a dog, a non-Jew. Yet here is Jesus openly speaking with a Samaritan woman and offering her living water—a share in the kingdom. It appears that these encounters have taught him a broader vision of his mission to bring about the kingdom. For those of you who have lived through drought or worked long hours on a farm in the sun, you know how precious water is when it is not available. 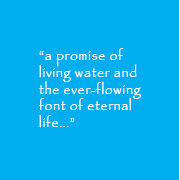 Living water would indeed be a hard concept to grasp. Spiritual thirst is even harder to slake. Mother Teresa inscribed Jesus’ words from the cross, ‘I thirst’ next to the crucifix on the walls of chapels in the convents of her order. But the thirst she refers to is that of Jesus for us; the mission of the order is “to quench the thirst of Jesus for souls, for love, for kindness, for compassion, for delicate love.” Mother Teresa sees Jesus' "I thirst" as a very personal statement spoken to each individual today, at every moment. And she said Jesus is constantly awaiting our response to his thirst. Both are important: Jesus’ thirst for our response and our thirst for living water—and important for us, especially as we ponder the Way of the Cross this Lenten season, that these words sink in—that they take us to a deep place in our souls, knowing that satisfying that thirst for living water is a lifelong journey.